The Well-Rounded Mama: Variability of Uterine Efficiency? One of the many things that annoys me in obstetrics is when doctors say, "Every cesarean I perform is necessary." Or when laypeople say, "Well, if you had a cesarean, I'm sure it was necessary. The doctors wouldn't do one if it wasn't really needed." Oh yeah, really? Every cesarean? All necessary? 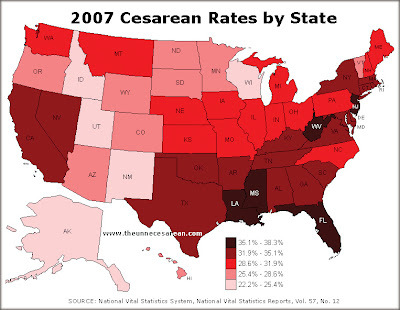 Then why do you have such variability of cesarean rates from one state to the next? From one historical time period to the next? From one doctor to the next? From one hospital to the next? Look at the map above. (These rates are from 2007; keep in mind that the rates are higher now.) The cesarean rates vary strongly from state to state, and even region to region. Do you really think the uteri of women in Utah, Idaho, New Mexico, Wisconsin, or Alaska are more effective and work that much better than the uteri of women in the Deep South? Is there something inherently less efficient about the uteri of New York and New Jersey women, who have some of the highest cesarean rates in the country, compared to the uteri of their close neighbors in Vermont? Or perhaps is there a pattern of practice that varies from one state to the next, from one region to the next, that influences cesarean rates and tolerance of questionable cesareans? There has also been a huge shift in cesarean rates over time. How could that be, if all cesareans are "necessary"? Are modern uteri that much less efficient and effective than uteri from 40 years ago? No, what's happened is that practice patterns have shifted, technology has improved, and cultural attitudes among caregivers towards cesareans have shifted as well. 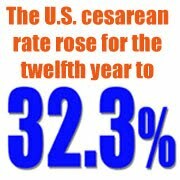 See here for a discussion on how cesarean rates have jumped so strongly in the past 30 years and why. All doctors are not alike. Some are so fast to do a cesarean it'd make your head spin; others are really dedicated to doing cesareans only when necessary. Some would like to do only truly necessary cesareans but feel pressured by medico-legal concerns and "standard of care" issues to do cesareans they find questionable. Most physicians fall somewhere in between. Research from a decade ago (when lowering the cesarean rate was still a priority) found significant differences in inter-practice variability between physician groups. So it really DOES matter which provider you choose to attend your birth. Your chance of getting cut may vary significantly between Dr. X and Dr. Y.
Alas, studies like this are harder to find nowadays, because few doctors (and fewer hospitals) are interested in lowering the cesarean rate. Without a glaring spotlight on the practices that increase cesareans, doctors have limited motivation to change their patterns and lower cesarean rates, and strong motivation to go with the choice that is less risky legally and more convenient for their schedules. As a result, individual doctor cesarean rates may grow out of control with few checks and balances, making the choice of birth attendant even more critical these days. Oftentimes an excellent choice is to change the type of birth attendant you choose. Choosing a midwife or family doctor for your care can significantly lower your chances for a cesarean, probably because of practice pattern differences between midwives, family doctors, and obstetricians. 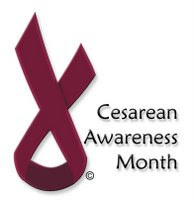 Some care providers claim that they don't care how many cesareans they perform because their top priority is getting healthy babies. But this ignores the fact that a high cesarean rate is often associated with considerable harm to babies. And of course, they should care about both a healthy baby and a healthy mother. Duh. It is clear that different patterns of physician practice, different style philosophy, and many other factors influence cesarean rates. Thus, it is smart to ask a lot of questions about typical practice patterns and attitudes when interviewing potential caregivers. Your chances of getting cut will vary a lot, based on who you choose. What about inter-hospital variability in cesarean rates? The New York Times just published a fascinating article on the difference in cesarean rates between two hospitals, just five miles apart on Staten Island. One hospital, the Staten Island University Hospital, has a c-section rate of about 23%, and its 2008 cesarean rates actually went down, unlike the U.S. and New York City rates. On the other side of the coin is Richmond University Medical Center, whose cesarean rates went up and reached an all-time high of 48.3%. For five years running, it has achieved the dubious honor of being the hospital with the highest c-section rate in New York City. One of the key reasons that Staten Island University Hospital has been able to keep its cesarean rate at half the rate of the other hospital is that they do not allow unnecessary inductions in first-time pregnancies before 41 weeks, and doctors who perform a lot of cesareans "invite scrutiny" of their management. Having to defend questionable cesareans gives doctors motivation to keep their numbers more reasonable. "If a woman has a third or a fourth Caesarean, the maternal morbidity and mortality is astronomically higher," Dr. Maiman said. "That's when you see women dying in childbirth from obstetrical hemorrhage." Compare that to hospitals who force women to have multiple repeat cesareans, even when they don't want or need them. Attitude from the top can make all the difference sometimes....both in primary (first-time) cesareans and in repeat cesareans. Some hospitals (like Richmond University Medical Center) like to claim that their cesarean rates are higher because they treat a lot of high-risk women. There's some truth to this claim, of course, but it's also a way of blowing smoke so people won't question their excessive numbers. If high-risk patients increase the cesarean rate a certain amount, then hospitals with similar loads of high-risk hospitals should have similar cesarean rates....yet the cesarean rates differ markedly, even among "high-risk" hospitals. Unfortunately, in many hospitals, labeling a woman "high-risk" simply means that no one will question whether or not her cesarean was really necessary and gives doctors carte blanche to cut as much as they want to, regardless of whether the cesarean was truly needed. In my own city, there are several hospitals that treat the highest-risk patients from all over. The c-section rate in all of them is too high, but one (40+%) is quite a bit higher than the others despite a similar patient load. Compare that to the "high-risk" hospital on Staten Island with the 48% c-section rate. Or the hospital in Florida with the 70% c-section rate. Cesarean rates will vary somewhat depending on risk caseload, but beware a hospital that uses that as an excuse to justify doing a lot of cutting. High-cesarean hospitals, even those that serve more high-risk women, should be avoided. Some information on Canadian c-section rates is also available. No one with any sense has a problem with life-saving, necessary cesareans. 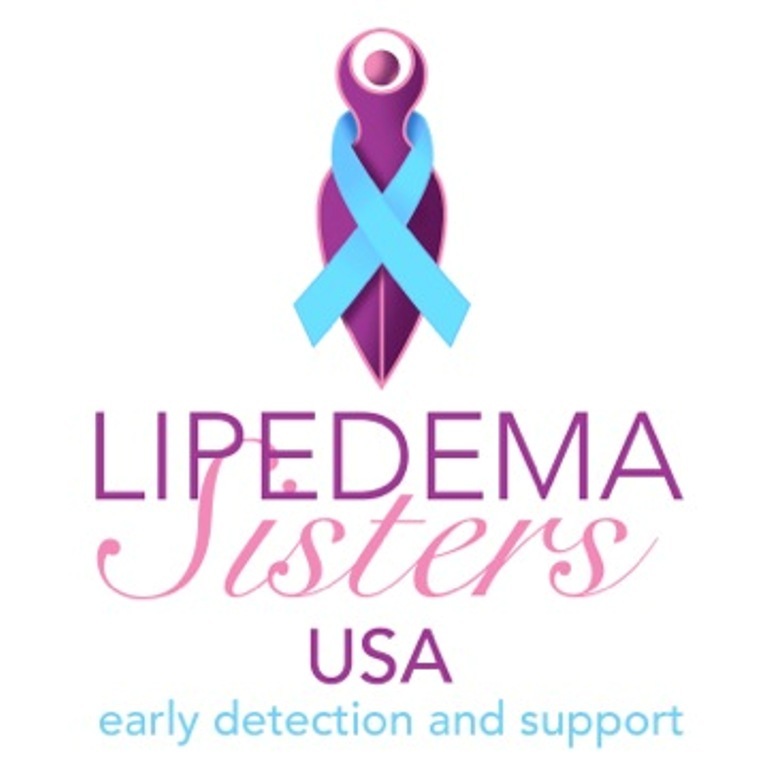 If you need one, it's wonderful to have this option, and sometimes it really can save mothers and babies. Huzzah to the doctors who keep this life-saving option available when needed, and for their skills and tools that help minimize the risk from this procedure as much as possible. However, there is NO QUESTION but that the current cesarean rate is inflated by many cesareans that are questionable in nature. There should be NO reason for such wide variations in cesarean usage from one state to the next, from one hospital to the next, or from one doctor to the next. Sure, sometimes there are going to be some differences inherent because of high-risk caseloads.....but even among hospitals that handle large numbers of high-risk cases, the c-section rate varies considerably. Something else besides risk status influences cesarean rates, and that something is birth climate and provider patterns of practice. Therefore it is absolutely critical that you choose your provider and birth location very carefully. Choose your birth provider and birth location with your eyes wide open, not randomly. Do your research and ask lots of questions. Choose one that is in line with your birth priorities and philosophies. Don't choose someone based solely on proximity, recommendations from others, or convenience. These can all be legitimate factors to consider, but they should be weighed against the practice pattern and intervention rate of the providers you are considering, as well as the style of care you prefer. Your chances of a cesarean will vary GREATLY from one provider to the next, from one hospital to the next, from one area of the country to the next. Therefore, it is wise to choose from a basis of knowledge, not ignorance. Don't assume providers are all the same or that your chances for a certain type of birth are the similar whomever you choose. A careful look at the data shows that this is not true at all. All cesareans are NOT "necessary." If your chances of being cut vary so greatly from one provider to the next, one hospital to the next, one state to the next.....then something else is going on here. Be a savvy consumer and choose wisely. Most graphics by Jill from The Unnecessarean blog. U.S. Map by Jessica Turon, published first on http://www.unnecessarean.com/ Thanks for permission to use the graphics and data. I am an obstetrician with over twenty years of experience who is trying to decrease the number of cesarean deliveries. I believe that you will not be able to reduce the number of unnecessary cesarean deliveries until you take the time to better understand the statistics. Once you better understand the statistics you will realize that what we need is a cesarean birth measure not a cesarean delivery rate. A cesarean birth measure corrects a cesarean delivery rate using the main risk factors that increase a woman’s chance of having a cesarean delivery. With this correction we can find the labor management strategies that will result in the fewest number of cesarean deliveries. You can find information on the pitfalls of the current way that we report cesarean delivery rates as well as the answer to why is the cesarean rate increasing on my website www.Birthrisk.com. I just wanted to drop you a line and tell you how much your website has helped me with my last two pregnancies and how much I am now enjoying your blog. I can tell the work that you put into it!!! I also wanted you to know that I am planning my first homebirth this September. In the past I was too afraid to seek out a midwife because I was 'overweight' and figured that would risk me out. 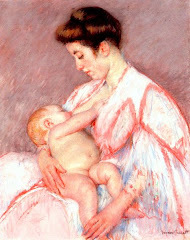 I did my research and interviewed several midwives and found one I love!!! I have told her about your site and blog and I direct other plus size moms here as well. thanks so much for all you have done and do!! !